I didn’t tell him this but when I read his response it was as if the heavens opened up and the good Lord said those words to me. Seriously, I heard harps in the background. Through experience, I know in the future I want to be my own boss. I know there will always be someone higher but, I do want to go as high as I can in the corporate ladder so that I don’t have to deal with bullsh*t. I want to have the freedom to create my own schedule while banking in Benjamin’s. Someone better call me “Patta-Cake” because I’m trying to bake bread. YA HEARD MEH??? I love elegance and classic ambiance way too much to not try to set myself up to afford the “good life.” I don’t need to be Gates or Trump rich. I just want to be wealthy enough to say “next week I want to be in Rome”…and actually do it. I’ve been contemplating law school for a while now. I’m trying to build an empire while creating social change. Criminal matters don’t really entice me much. I’d rather work in corporate or entertainment law handling corporate matters. I still want to work within media, fashion, and entertainment. Eventually I would like to own a non-profit organization as well. 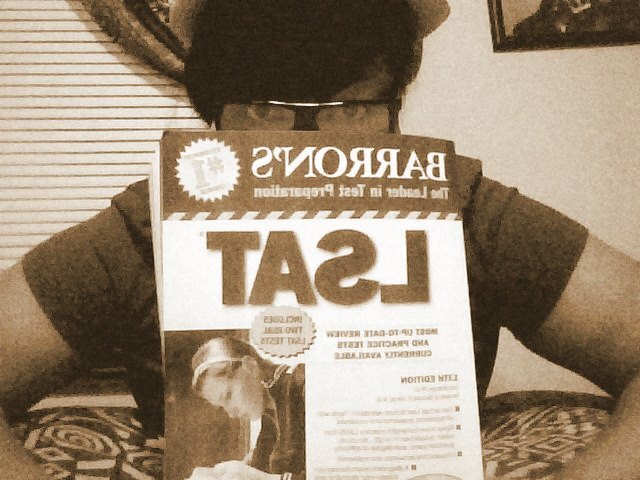 So the day I left the office I went to a local bookstore and picked up the Barron’s LSAT study guide. I figured what the heck! The worst that can happen is I don’t get into law school; but I’m going to try. It’s better to try then to say “I should have” later on. I have yet to take pre-law or legal courses, nor have I ever really liked public speaking. AND I’m as nervous as idk what to take the LSAT. I can imagine its normal to be nervous. I just feel confident that this may be the best route for me to take.